Born in New Jersey, USA, in 1947, Candramauli Swami came in contact with the International Society for Krishna consciousness (ISKCON) in Denver, Cororado, at the age of twenty-four. In 1973, he began practicing Krishna consciousness in New York City and shortly thereafter began serving at New Vrndavan farm community in West Virginia. He received initiation in 1973 from His Divine Grace A.C. Bhaktivedanta Swami Prabhupada. In 1986, he accepted the sannyasa order and began preaching in Cincinnati and Columbus, Ohio. In the early 1990's he became involved with the ISKCON Prison Ministries in America, and began visiting inmates, holding programs, along with writing letters to inmates and sending in Srila Prabhupada's books. In 1995 he began serving as the resident sannyasi in Chicago, where he is based today. 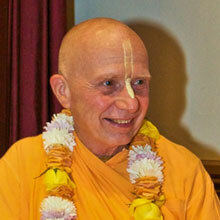 At present, Candramauli Swami preaches in America, India, Western Europe, Slovenia, Croatia, Italy, and the UK. He is an initiating spiritual master within the ISKCON society.